Last week, we touched on a few big name players that fantasy owners should not hesitate to jump on, and some they should shy away from. This week, we will spotlight a few guys who could be steals in fantasy drafts and may significantly boost the make up of your team. So, you missed out on Ryan Braun, Mike Trout or Josh Hamilton, or you just need that last outfielder? Maybe you just need some depth at the position? 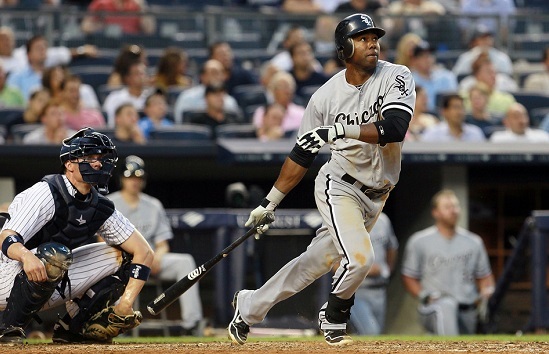 Take a look at Chicago White Sox center fielder Alejandro De Aza. He's a talent on the rise. Overshadowed by more mainstream names on his own team, De Aza's true value often goes unnoticed. With 26 stolen bases last season, he instantly adds a speed element to your lineup. Paired with a .349 on-base percentage, De Aza finds ways to get on base to utilize his speed. Don't expect him to put up a big number in runs batted in or home runs, but he will make a lovely contribution to a lot of other stat lines in your league. It's late in the draft and you realize you didn't manage to snag a Joe Mauer or Buster Posey. Second-tier catchers are gone. Where to go? Los Angeles Dodgers catcher A.J. Ellis may be a viable option. Hitting at the bottom of a very stacked LA lineup will provide a lot of action for Ellis. After nibbling around Matt Kemp, Andre Ethier, Adrian Gonzalez and Hanley Ramirez, Ellis will find himself in quite a few run producing chances. Pitchers will also find themselves pitching more directly to Ellis, giving him plenty of pitches to put in play and put in play with authority. Look for him to be a solid fantasy pick that a lot of people will probably overlook. As you are looking through your roster, you see you need more pop in your lineup, but all the big name sluggers and run producers are already off the board. Now what do you do? Look no further than Pittsburgh Pirates first baseman Garrett Jones. Coming off a 27 home run-86 RBI season, Jones will get plenty of chances to put up his fair share of stats with the emergence of Andrew McCutchen and Pedro Alvarez. Add that in with him being a left-handed hitter in PNC Park, and expect Jones to make you happy as a fantasy owner. Just remember, when picking your fantasy team, do not panic once all the household names are gone. Players like De Aza, Ellis and Jones are hiding deep in the draft waiting to be selected, and could be the difference between a championship team and a team that comes up short. I know you guys had a fantasy football league last season. Any plans to do a baseball one? We actually had readers email in sayin they wanted us to host a Fantasy Football League. Oddly, we didn't have any requests for a baseball one.